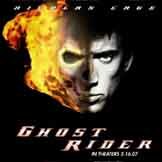 The film was just pushed back to Feb. 16, 2007, but Sony Pictures on Tuesday provided a first look at the movie Ghost Rider at the film's official site. A 10-second flash clip shows Nicolas Cage and his CGI alter ego, with Cage's voiceover. "I'm the only who can walk among both worlds...the Ghost Rider," Cage says. Writer/director Mark Steven Johnson described the technique used to bring Ghost Rider to life on the screen. "We film Nic or his double, dressed as the Ghost Rider, with the spikes, chains, leather and everything on him. But he wears an interactive light collar around his neck, sometimes a whole green helmet, and that's what we're going to be removing," Johnson said. "So it is the person, it is the actor, but the head itself is CG. And that was our biggest challenge, making sure it looks absolutely fantastic. "And being able to use fire as a way to give expression, which you can't with a skull. You take the shadows of the fire and the way the fire moves to give expressions and moods, which is really great because you can't get that in the comic. You can see it change before your eyes. "When Ghost Rider's angry, he'll go white-hot with flame. When he gets sad, it will literally go blue. There's a way you can use the fire as an extension of his personality." Click on the thumbnails below for larger images and look for more on Ghost Rider soon here in The Continuum. Justice #2, the second chapter of the 12-part maxi-series by Alex Ross, Jim Krueger and Doug Braithwaite, has sold out at DC Comics. With Justice #3 arriving in stores on Wednesday, DC Comics announced that Justice #2 will go back to press for a new printing scheduled to arrive in stores on Jan. 18. This new printing will feature a cover by Ross and Braithwaite that has never appeared on a comic-book cover before. "I'm absolutely delighted that Justice #2 is going back to press," Braithwaite said. "This series is bringing out the best in the whole creative team, and the response from fans and professionals to the first two issues has been amazing, and I'd like to thank them all for their support. Having just finished pencilling Justice #6, I can tell you there is even more sensational stuff coming your way." For covers and three- to four-page previews of DC Comics titles arriving in stores on Dec. 28, CLICK HERE. Titles include JLA: Classifed #15, Vigilante #4 and Solo #8. Alias Comics has released its solicitations for March. * Above is a first look the covers to Books of Doom #3, Cable/Deadpool #24, Exiles #75, Marvel Adventures Fantastic Four #8, New Thunderbolts #17, New X-Men #22, The Pulse #13, Ultimate X-Men #66 and Uncanny X-Men #468. Click on the thumbnails for larger images. * Brad Meltzer and Ed Benes are the creative team for Justice League of America, launching in June from DC Comics. * Marvel Comics is reporting that Son of M #1 has sold out. The publisher has no currently plans for a second printing. * Coming Wednesday: Marvel news -- and much more!!! * Tuesday, Dec. 13: Witchblade movies, Marvel's Annihilation, Teen Titans, The Batman, Alias' Twin Blades, Marvel First Looks and Oni Press for March. * Monday, Dec. 12: DC Comics for March, Blade TV, Cyborg on Smallville, Neal Adams covers Green Lantern and Dave Sim on Gun Fu. * Saturday, Dec. 10: Teen Titans, Cyberforce and Archie news. * Friday, Dec. 9: Painkiller Jane's Emmanuelle Vaugier, Marvel toys, Timothy Truman on Conan and Marvel First Looks. * Thursday, Dec. 8: Fantastic Four movie toys, X3, Image Comics First Looks and Batman Beyond and Justice League DVDs. * Wednesday, Dec. 7: Dark Horse Comics for March, Moonstone books for April, Sin City sequel, V for Vendetta images and Constantine on Cinemax. * Tuesday, Dec. 6: IDW Publishing for March, Marvel news. * Monday, Dec. 5: X3 images, Fantastic Four sequel, Heroic Publishing for March and 360ep's 7-cent issue. * Saturday, Dec. 3: Kelsey Grammer talks Isis movie, The Batman, Claypool Comics for March and First Looks. * Friday, Dec. 2: X3, Transformers and Devil's Due First Looks. * Thursday, Dec. 1: X3, Marvel First Looks, Paul Jenkins exclusive to Marvel, Pang Bros. on Darkness movie and DC Comics stamps. * Wednesday, Nov. 30: Marvel, Image and Dark Horse First Looks, The Simpsons DVD and Paul Storrie writes The Muse. * Tuesday, Nov. 29: Ultimate Avengers' Captain America, The Batman and Lois & Clark DVDs, Iron Man: The Inevitable, DC Comics First Looks and Alias Comics' solicitations for February. * Monday, Nov. 28: Jimmy Palmiotti talks Painkiller Jane, Peter David's Mid-Ohio-Con panel, Superman Returns, The Simpsons and First Looks. * Saturday, Nov. 26: Tom Scioli talks Godland, Mid-Ohio-Con Hulk panel and Image First Looks. * Friday, Nov. 25: Avatar Press' February solicitations and First Looks. * Thursday, Nov. 24: Painkiller Jane, Hellboy, The Batman and Paula Peril. * Wednesday, Nov. 23: Marvel First Looks, Chris Claremont's next project, X-Men: Deadly Genesis second printing and Ramon Bach exclusive to Marvel.